When designing a girl’s bedroom, there’s more than enough room to get creative with color schemes, patterns, and, of course, layouts. 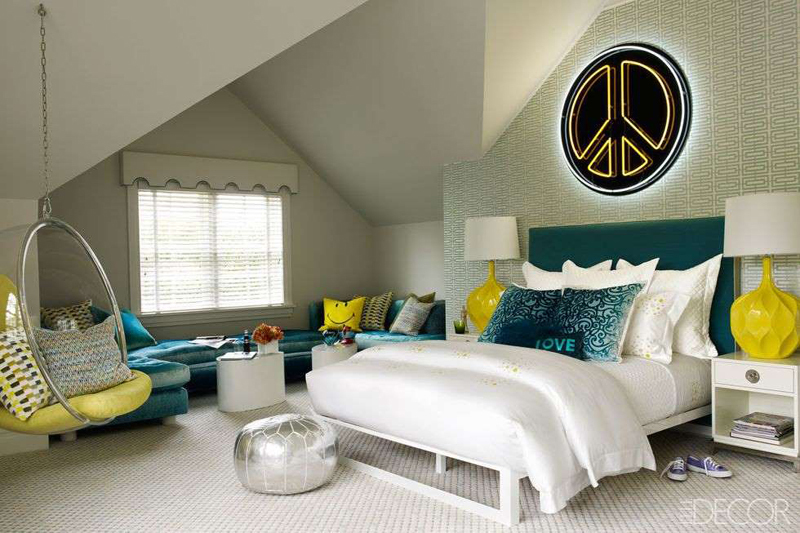 Here are 15 inspiring ideas to achieve a sophisticated bedroom design any girl would love. In a teenage girl's bedroom designed by Lee Ann Thornton Interiors, a pink upholstered headboard balances gray walls and patterned bedding. In a Hamptons retreat, a girl's bedroom features linens by E. Braun & Co., yellow vintage lamps from San Francisco, and a John Derian pouf. The wallpaper is by Osborne & Little and both the walls and ceiling are painted in Benjamin Moore's Dove Wing. MA Allen Interiors chose a fun lavender hue for the walls of a girl's bedroom. Pops of green and patterns, including florals and stripes, make for a high-style design that's still appropriate for a kid. 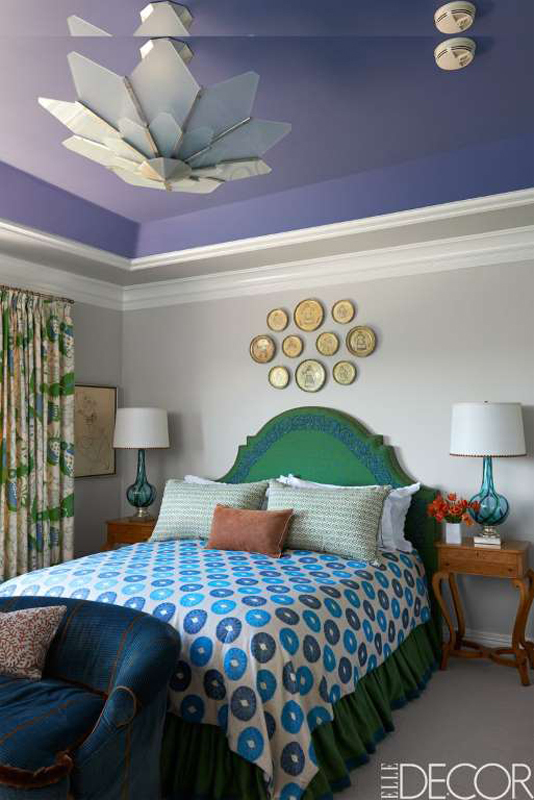 In a girl's bedroom in a Manhattan apartment, designer Katie Ridder chose a custom-made Charles H. Beckley bed upholstered in Butterfly by Lori Weitzner for Sahco Hesslein. The walls are covered in a complementary Muriel Brandolini cotton. Designer Alex Papachristidis decorated this home for a couple that had been married just a year when the project began, and who welcomed their first child, Elle, during the renovation. The crib in Elle's room is by Dwell Studio, and the chair, a Paris flea-market find, is upholstered Manuel Canovas fabric. The walls are covered in a Cowtan & Tout cotton, and the carpet is by Beauvais. 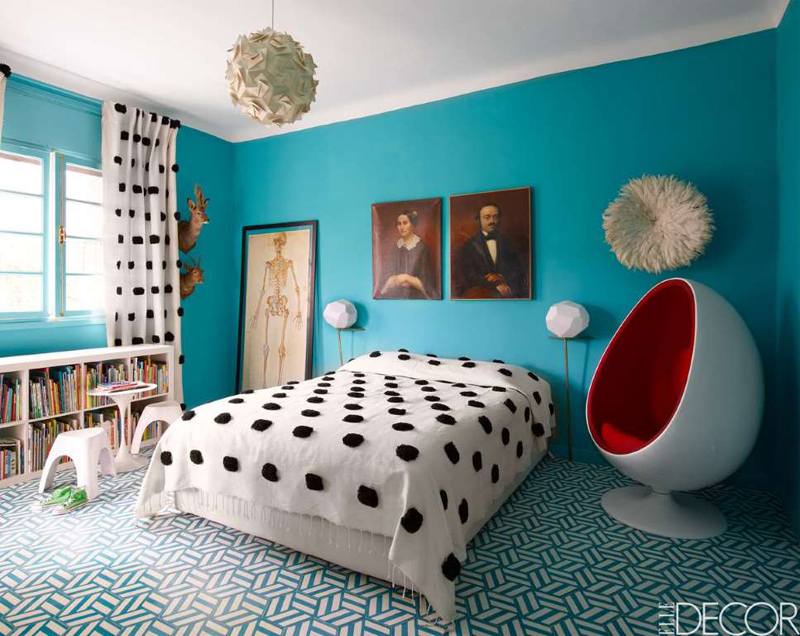 In their Marrakech house, the founders of the tile firm Popham Design found opportunities to indulge their passions for pattern and playful color, particularly in their five-year-old daughter's room. The vintage chair is by Eero Aarnio, a pendant light is by Claire Norcross, and a feather headdress is from Cameroon. The floor tiles are Popham Design's Hex Knot. 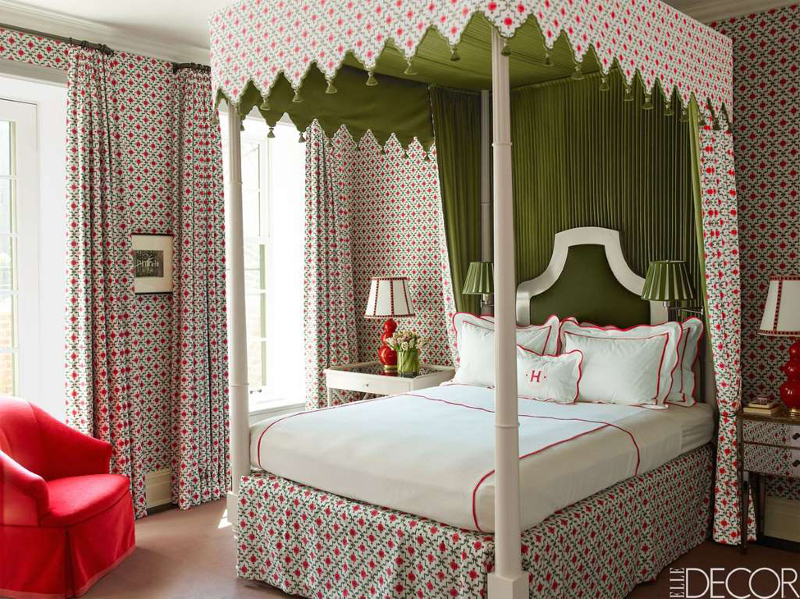 Colorist Katie Ridder designed this family townhouse on Manhattan's upper East Side, where the daughter's room features a bed, canopy, and curtains in a fabric by Muriel Brandolini, which also sheathes the walls. The lamp is by Christopher Spitzmiller. Young designer Megan Winters infused her dream house outside Chicago with Parisian flair and her own exuberant personality. 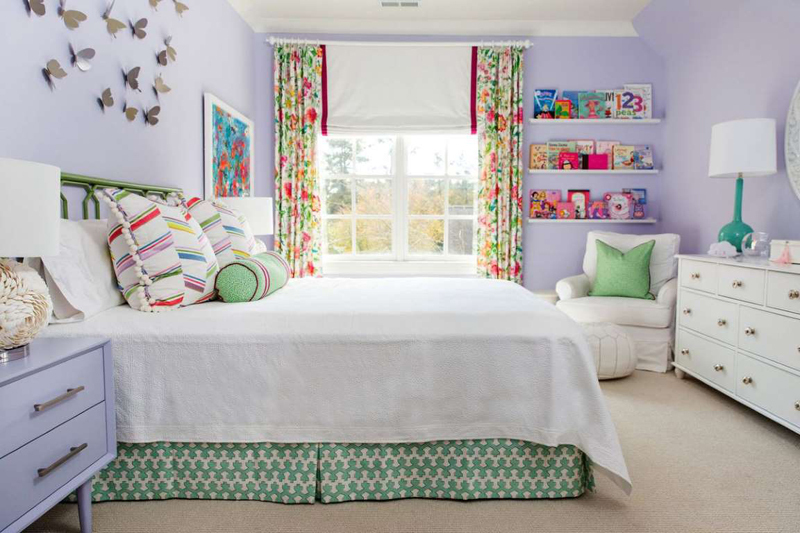 A niece's bedroom features a vintage bed, linens by Frette, and an ottoman by Oly. The light fixture is vintage, the print is by Helen Frankenthaler, the wallpaper is by Brunschwig & Fils, and the carpet is by Merida. 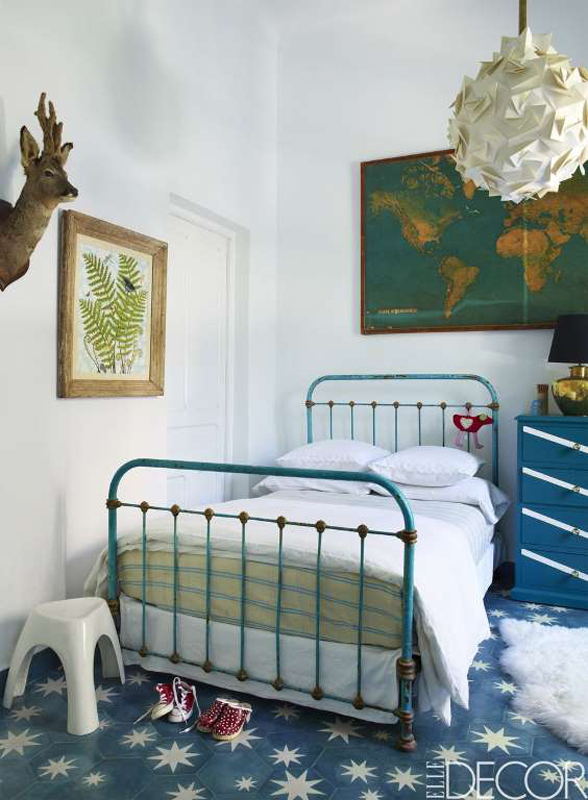 In this Moroccan home, the daughter's room includes a vintage iron bed that came from a Marrakech flea market. The map is vintage, the light fixture is by Claire Norcross for Luminosity, and the print is by Roger Sandes. 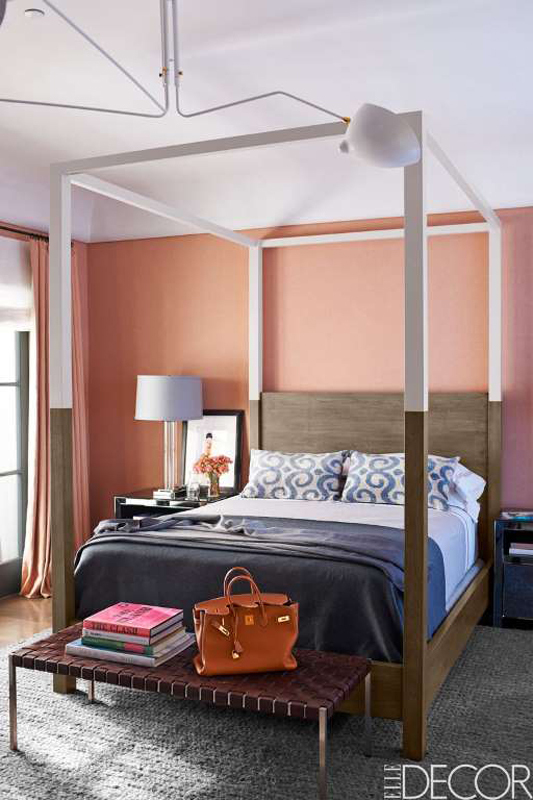 In the Los Angeles home of fashion entrepreneur Mossimo Giannulli and his wife, actress Lori Loughlin, a custom-made bed and a woven leather-covered bench by Mark Albrecht are in their daughter Olivia's bedroom. The lamp and rug are by Restoration Hardware, and the walls are covered in a linen by Lulu DK, which was also used for the curtains. Designer Kim Alexandriuk applied her love of modernity to help a longtime client reimagine her traditional stone house in Bel Air. Circa-1950 Murano glass lamps and 1930s Italian tables, all from Downtown, flank a custom-made bed in a daughter's room. The custom-made sofa is covered in an Elitis fabric, the curtains are of a linen by Christopher Farr, the walls are painted in Farrow & Ball's Clunch, and the ceiling is in the company's Pitch Blue. Kate Rheinstein Brodsky's Manhattan apartment is the picture of panache. In the girls' bedroom, the beds are by Hollyhock, the canopy curtains are of a chintz by Fabricut, and the sheets are by D. Porthault. 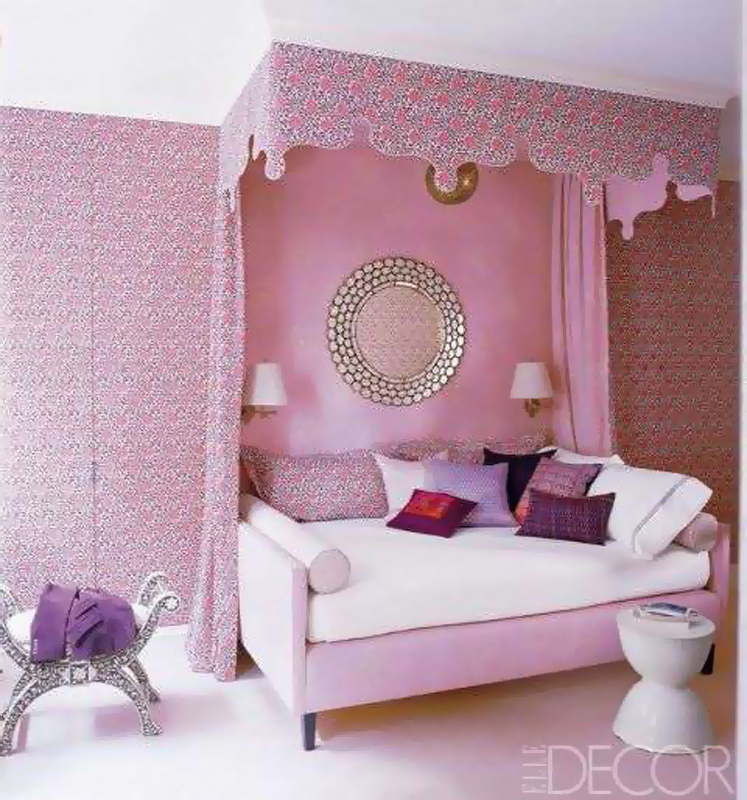 The carpet is by Patterson Flynn Martin, and the walls are painted in Benjamin Moore's Bridal Pink. A young family enlisted Timothy Haynes and Kevin Roberts to craft a stylish new take on the traditional beach house that reflects both a refined sensibility and barefoot ease. In the nursery, the sofa is by Jonathan Adler, the 1980s table is by Milo Baughman, the 1960s fiberglass chairs are Italian, and the carpet is by Missoni. The ceiling is painted in Benjamin Moore Aura in Rhododendron and Peachy Keen, and the wood blinds are painted inBenjamin Moore Satin Impervo inOnyx. With the help of decorator Palmer Weiss, a young San Francisco family with three daughters rejuvenated a rambling 1908 Shingle Style house. Weiss designed the bunk beds; the light fixture is by Oly, the shade is of a hemp by Peter Dunham Textiles, and the walls are painted in Benjamin Moore Aura in Pink Fairy.